As the whole world watches the agony of Syria drags on. Nowhere is this epitomised more than in the city of Aleppo. The recent breakdown of the relative ceasefire came after the destruction of a UN aid convoy and the murder of 20 aid workers. Since then the regime and its Russian backer have pounded the city relentlessly from the air (where they have total superiority) adding more misery to the starving and ill citizenry who are dying not just from the bombing but also from the lack of food and basic medical care. The apparently deliberate targeting of hospitals is particularly despicable. Anyone with any degree of human sensibility can only look on at this with anguish but we must also understand that this is not some act of God. This is the product of real humans deliberately murdering innocents. It is an act of evil that is the product of a social system that is in decay. The misery of Syria is the product of the bestial appetites of a capitalist order in crisis. In its decaying imperialist epoch none of the parties to this war can give an inch. It is a war to the bitter end where the human suffering is dismissed as “collateral damage”. This bitterness is a result of the complex of imperialist interests which contend for control across the Middle East and across the world. For Russia it is to defend their last satellite in the region, for Iran and Saudi Arabia it is a struggle to become the dominant regional power. For the US the issue has always been about how to continue the “American century” and this means to control vital energy supplies which underpin the dominance of the dollar in world trade. This in itself is vital to the US as it allows it to export its own economic problems to the rest of the world via the dollar trade. The US imperialist effort though has been dogged by the arrogance of imperialist dominance which by destabilising Iraq and dismantling the (admittedly brutal police) state there led to the rise of both Salafist and IS jihadism. Just add the financial collapse of the world economy which led to the Arab Spring which eventually reached Syria and you complete (albeit in simplified form) the causal chain that led to the current barbarism in Syria. The following article which is a translation of some extracts from a longer article in Prometeo (theoretical journal of Battaglia Comunista) focuses on the international role of Turkey in this affair. We will look at the other actors in detail and take a closer look at the domestic situation of Turkey since the coup in future articles but the following piece gives some pointers as to what lies behind the oscillations and contradictions of one imperialist actor in this appalling drama. A decade ago Turkey was regarded as one of the most dynamic actors in the Middle East. As one of the so-called MINT countries it has high growth rates (which remained relatively high even after the financial collapse in 2008). Turkey was also seen as an ally of Egypt, Israel, the USA, Russia and even Syria. Its form of moderate democratic Islamism seemed the way forward for other states where Muslims were in the majority. Turkey fell out with Israel over the attack on Turks trying to take supplies to Gaza but that only boosted Turkish influence throughout the Arab world. 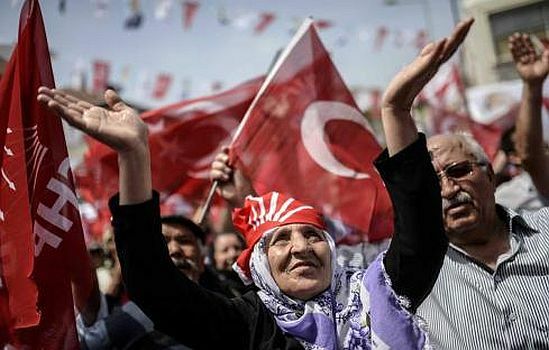 Even the Arab Spring seemed to make Turkey more powerful as it had many admirers in post-Ghadafi Libya and in Egypt where it gave support to the Morsi regime of the Muslim Brotherhood. It seemed that the Turkish model was ideal for export to other countries with majority Sunni populations. However this did not last long. The continuing chaos in Libya and the overthrow of Morsi were major setbacks. After the Gezi Park attacks and revelations of corruption in the Erdogan regime by Gulenist judges, Erdogan’s focus became more and more against his internal enemies within Turkey. Foreign policy became a game of playing the strong man to the home audience which meant also facing down a revived Kurdish nationalist movement. It was for this reason that IS were allowed and even at first encouraged to use Turkey as a conduit to Syria (as anti-Assad fighters this suited Turkey at the time). And when Russia started to actively intervene in Syria the Turkish air force downed one of is fighter bombers. The consequences were increasing isolation abroad. Although Erdogan dismisses any talk of a crisis Turkey has potentially enormous economic problems. Turkey runs a significant balance of payments deficit, $32bn in 1015, which means it needs to borrow from abroad. It has already had is bonds reduced to “junk” by two of the major rating agencies which means that raising foreign loans will become more expensive and difficult. This comes at a time when its substantial tourist industry saw a loss of 30% in visitor numbers in the first half of the year (a 93% drop in those from Russia once Putin banned package holidays and flights to Turkey). Together with the threat that Russia would abandon its support for infrastructure projects (including the Turkish Stream discussed below) Erdogan was compelled to make an about turn. The same goes for its support for IS which had become a liability both at home and abroad as suicide bombings in Turkey’s major cities and the growth of a US-backed Kurdish enclave on Turkey’s borders threatened the regime from two directions at once. This is the background to explanation of the contradictions in Turkish foreign policy which follows here. Turkish imperialism is on the move. Erdogan is trying to recreate the Ottoman Sultanate by fighting both internal and international enemies. At the same time as working militarily with the US he is cooperating with Russia in the construction of the Turkish Stream (gas pipeline) with the aim of creating the most important energy hub in the Mediterranean. He was with Isis before, but against it now. He opposes the Syrian regime, but also the Kurds who are fighting it. Meanwhile internal opposition is being physically eliminated in the name of building an "oil sultanate" which needs order and security inside and outside its borders in order to flourish. According to the shared wisdom of international political science, Turkey’s changed attitude towards Isis was the result of a suicide bombing in early July in Suruc where 32 people died. According to the pundits, Turkey’s previous attitude towards the Caliphate’s jihadists was apparently one of "non-interference" in the "Siraq" issue, allowing things to flow at the pace set by other actors. In fact, it allowed the Caliph’s men to cross the border, smuggle oil and arms on both sides, set up training camps, in practice acting as the basis of support for IS military and commercial operations. Ankara’s Army not only remained a spectator, despite being deployed only a few hundred metres away during the siege of Kobane, but also allowed the subsequent capture and killing of civilians. Erdogan also prevented the US from using Turkish airfields to strike against IS military facilities. His only concern seemed to be the overthrow of the Assad regime in Syria and, if IS militias were fighting for this, so much the better. Then suddenly there was an about-turn. Ankara began to bomb IS locations, allowed the US Air Force to use the Incirlik airbase and, in practice, stood alongside the Coalition against the Islamic State. As usual, the explanation for this change does not lie in ideological or religious aims nor even, as happened in this case, the tragic terrorist act that caused the death of 32 people. The underlying reasons for the policy switch are the imperialist goals of Erdogan, the aspiring neo-Ottoman sultan, which were unlikely to be attained by continuing to support Baghdadi, even secretly and unofficially. Erdogan emerged victorious from the 7 June election but without an absolute majority that would allow him to begin the constitutional path towards his much hoped-for aim of a presidential system bordering on dictatorship. The partial but inadequate victory forced him to revise his tactics to include gaining the consensus of political forces and anti-jihadi parties who were previously his political opponents. This would also increase his credibility in the battle within his own party, the AKP, against the vice-president and arch-rival Arinc and his predecessor Abdullah Gul, as well as some sections of the tame army and beyond who have become impatient with the President’s foreign policy. In short, the aim is to turn the army into a weapon of the AKP party, or into a kind of private militia under the command of a revived Ottoman Sultanate. All this in the hope that the AKP will be able to get the popular support at the next election, already announced for November 1st, that would allow him to be the new sultan of the "new" Ottoman Turkey. The change of direction is also sparked by another equally serious and pressing internal aim of violently repressing domestic opposition. Alongside the bombing of a few IS locations in Syria, there have been far more intense attacks on Syrian Kurds, who, almost alone with a few pro-Iranian formations, are currently fighting the advance of the Caliphate. Is this contradictory? Sure, but the fact is that for Erdogan its worth continuing the fight against the regime of Bashar el Assad as well as hitting his enemies, the jihadists of al Baghdadi and simultaneously weakening the Syrian Kurds in order to send a message to Turkish Kurds that there will never be a national future for them. Erdogan has tolerated, but with much trepidation, the emergence of a "Kurdish autonomous state" in northern Iraq as demanded by American oil policy. He fears that out of the possible disintegration of Syria another Kurdish state will arrive on the borders of Turkey and Iraq, thus stoking the autonomist ambitions of "his own" PKK. It is within this domestic framework that two episodes of fierce repression have to be understood. The first concerns the bombing of some PKK positions on Turkish soil, which effectively broke the fragile truce of 2012 between the Ankara government and Ocalan’s party. Erdogan's worries about the PKK on the ground acting more radically than implied by the agreements signed by its leader, gave him the chance for repressive and preventive action in a series of air raids on Kurdish positions far more devastating than those against IS militias. This has led quite a few domestic and international observers to surmise that the fight against IS is more like a "good" excuse to fight on the domestic front, for Erdogan much closer and more dangerous, than the Islamic State. In the second domestic episode the builder of the neo-Ottoman Empire grasped the nettle to eliminate another awkward partner from the political scene. On 31 March a member of the self-styled Turkish Marxist Party (DHKP-C) got into the Istanbul courthouse to kidnap and then kill the prosecutor of the Republic, Selim Kiraz. The latter was responsible for the investigation into the death of a young demonstrator during the Gezi Park days. The government's response was harsh. While there was intense bombing of the jihadi IS, which fell largely on the heads of Syrian Kurds and the PKK, the secret police carried out about three hundred arrests among leftists, producing one more death as “collateral damage”. This paved the way for a series of attacks by both the Kurds of the PKK and those of the DHKP-C on August 9, which ended with the death of militants in both organisations as well as the armed forces. These tragic episodes will certainly not halt Erdogan’s ambitions. Indeed, he will use the crackdown on terrorism as an excuse. Either the masses, the Turkish working class, must begin to develop a revolutionary perspective, or the aspirant dictator will have an easy life for his domestic political games. The other factor that has forced the Ankara government to change course is the changed international situation, in terms of both the imperialist balance of power and Turkey's role within a changing world in the profitable delivery and marketing of Asian gas. The most important shift in the imperialist balance of power in the area is the recent agreement on the nuclear issue between the US and Iran. Convincing Iran's new leaders to sign the agreement is above all a success for Obama’s international policy and something that was missing in the "curriculum vitae" of the soon-to-retire American president. According to him, the agreement, which requires Iran not to think about building an atomic bomb for ten years, makes the world a safer place, while keeping the number of members in the atomic club the same. Thus his diplomacy has achieved an important result which otherwise would have left things in a state of permanent crisis. In fact the outgoing president will pass the baton to his possible democratic successor with some good "results" in terms of foreign policy. In addition to Obama’s stated objective, the move, even if it does not draw Iran away from Russian influence, weakens their relationship with all the consequences for the entire region. This includes the attempt to remove Iran strategically from the intricate gas-oil arrangement between Russia and China, thus weakening its Caspian segment. For Rohani (President of Iran) the agreement with the US is the end of a nightmare. The removal of sanctions will give oxygen to the economy of the ayatollahs, in terms of trade and oil, relaunching Iran as the regional power well beyond the role it is already being playing in Syria, in Iraq, in the Kurdish question, as well as within the contradictory political and military tensions against IS expansionism. For Turkey on the other hand, the signing of the nuclear agreement was the beginning of a nightmare. The first concern was the loss of the support, albeit time-worn, critical and sometimes contradictory, of the United States. This changes the balance of power in favour of Iran, inevitably to the detriment of Turkey. It's probably in the light of this new situation that the Erdogan government is seeking the "middle ground" in international politics, by trying to mend relations with the US and with its "ally-enemy" Israel, restoring the old military cooperation sought by the Pentagon and which used to operate against Russia and its satellites in the Mediterranean. Although we should note that during the election Erdogan did not let up on his verbal attacks on Israel which many have described as anti-Semitic. But this is also part of the three cups game. Hence the change of direction against the Islamic State, the de facto entry into the anti-IS Coalition and the granting of the air base to the US, in order keep alive some relationship with the US government, and to continue to make it easier for Turkey to become the main oil hub in the Mediterranean. The now (more than likely) US policy shift toward Iran would be a setback to the ambitions of Erdogan and his imperialist pretensions so this demands at least an attempt at rapprochement with Washington's plans, even if they involve concessions that previously were not even on the agenda. In line with the new strategy, as early as last March, when it became clear that the nuclear deal with Iran would come about, the Ankara government brought its policy forward by signing a military agreement with Riyadh based on joining forces against the regime of Bashar el Assad, arming and financing all opposition armed groups secretly including, the al Nusra Front and Ahrar al Sham and, at the same time, fighting the jihadists of the Caliphate. If these moves are successful, it will enable the new Ottoman policy of Erdogan to move closer to the US, to absorb the likely return of Iran on the scene as acceptable damage, and ¬– more importantly – to continue to build its role as a key oil hub in the Mediterranean. The changes in Turkish foreign policy will not end there. Erdogan is a first-rate performer when it comes to keeping one foot in two shoes. After backtracking over IS in order not to antagonise US imperialism, after turning down the volume over Washington’s new course against Iran, Turkey’s arch enemy in the Caspian, and after reopening the dialogue with Israel in order to pursue its imperialist ambitions in the basin of the "Mare Suum" , Turkey has even put its foot in the Russian boot. The story of Turkish Stream pipeline begins with the inability of Russia to get the old project of South Stream off the ground. Europe did not want to be totally dependent on Russian gas, it was boycotted by the US for obvious competitive reasons and made impracticable by the behaviour the Bulgarian government, well trained for this purpose by the US government. Russia did not lose heart. On 7 May, 2015, the CEO of Gazprom, Alexei Miller, signed a final agreement with its counterpart, the Turkish company Botas, for the construction of a gas pipeline (Turkish Stream) that would bring gas to Turkey from the distant lands of Siberia through the Black Sea. Gazprom Russkaya got the task of building the structure, by-passing the "treacherous" Ukraine, and making it operational by the end of 2016. This will be a great opportunity for Russia to prove itself a reliable supplier of gas to southern Europe, and for Turkey, a real chance to build the only hub in the Mediterranean. But Erdogan's ambitions go beyond Russian energy resources. Sticking to the one foot in many shoes theory, the aim is to adminster Azerbaijani energy resources as well as – and why not – even those of the Iranian enemy, if the US can put in a good word (but it won’t happen without it). Currently the most important pipelines between the East and Europe pass through Turkey. Pipelines already in place are: the Iraq-Turkish-Ceyhan line carrying Iraqi oil from Barzani’s Kurdistan, as well as the Baku-Tbilisi-Ceyhan (BTC), the Baku-Tbilisi-Erzorum (BTE), the Trans-Anatolian pipeline, the Trans-Adriatic pipeline, plus Blue Stream. With the Turkish Stream pipeline Turkish imperialism would hold a "royal flush", so all agreements and alliances shift depending on the gas-oil routes already or about to be established. Anyone who presents a danger however remotely, to the great neo-Ottoman project which Erdogan has been working on for years faces an iron fist. Despite deep differences with Moscow over Ukraine, Syria and the referendum in Crimea (which Ankara has not yet approved), agreement on the Turkish Stream would open the door to other very significant deals. This is in sharp contrast to American expectations which, apparently, and contradictorily, Ankara seems to want to accomodate. If these plans materialise and directly reflect the contradictory oscillation between the various international imperialist poles, there will be a nuclear power plant at Akkuyu on the Mediterranean coast, built with the collaboration of the Russian firm, Rosatom, as well as a long series of economic and trade agreements between Ankara and Moscow which would raise the level of trade from the current $33 billion to $100 billion by 2020. This comes in the wake of Moscow and Beijing’s wider imperialist perspective which aims to include Turkey within the Shanghai Cooperation Organization (SCO), part of the now open clash between the Euro-Asian axis of Russia/China and the Euro-American axis. This reflects the same but opposing perspective of America’s attempt to draw Iran away from Russian-Chinese influence. Within this heterogeneous scenario, one thing is clear: If Turkey wants to contain the damage caused by the American nuclear agreement with Iran and promote the deal with Russia on Turkish Stream, it needs to sort out its domestic political structure and secure the immediate vicinity of its borders. It is no coincidence that Erdogan changed sides over the Islamic State when he saw that this would create a dangerous condition of instability on Turkey’s border, both immediately and in the future. For the same reason he has realised that if what’s left of Assad’s Syria's finally explodes, there is the risk of another Kurdish state emerging, following that of Massoud Barzani in Iraq, which would only increase the nationalistic ambitions of a more combative PKK, despite Ocalan’s volte face. Thus, weakening the Kurdish elements and any other form of opposition is just as important if not more, as fighting al Baghdadi and IS knocking on the door at its borders. In fact the almost simultaneous actions against IS, the Iraqi Kurds, the Syrians and against the parties of the radical left within Turkey are needed to contain the influence of Iranian Shiism and as a preventive act to defend the construction of the Turkish Stream which, like all big business, cannot tolerate any disruption. The stakes are too high for it to be disturbed by any element of political or social tension. Imperialism "obliges" them to do this because the laws of capital dictate to everyone and everything.